Skin is the body’s largest organ and acts as a protective barrier from infection, injury, light and heat. It also regulates body temperature and stores water, fat and vitamin D. A basic understanding of skin anatomy and physiology is an essential part of improving skin health. There are three structural layers of the skin: the epidermis, the dermis and the hypodermis. Skin varies in thickness depending on the area of the body and age. The epidermis is the thin outer layer of skin and is made up of five layers. The bottom layer, the basal layer, has cells shaped like columns that divide and push already-formed cells into higher layers. As the cells move up, they flatten and eventually die and get sloughed off the skin’s surface. Epidermal skin cells are known as keratinocytes because they synthesize and contain the waterproof protein keratin. Protein bridges called desmosomes connect the keratinocytes, which are in a constant state of upward motion from the deeper to the superficial layers. The stratum corneum is the most superficial layer of the epidermis. At this level, the cells are called corneocytes; between the corneocytes are lipids (fats). The stratum corneum is the skin’s natural physical and water-retaining barrier. It takes approximately 28 days for a new epidermal cell to move up through the layers of the epidermis and become a corneocyte. This is called the epidermal transit time and it becomes prolonged with age. The epidermis also contains specialized cells. For example, melanocytes in the basal layer produce pigment (melanin), and Langerhan’s cells are considered the first line of defense of the immune system in the skin. The dermis is composed of fibroblasts, which produce collagen, elastin and other structural materials. Collagens make up 70% of the dermis providing structure and strength. Elastin lends elasticity and flexibility, while other materials, including hyaluronic acid, maintain hydration and viscosity. Blood vessels, lymphatics, immune cells, nerve tissue, hair roots and sweat glands are also found in the dermis. The hypodermis is the innermost layer of the skin, which lies beneath the dermis. It consists of fat, blood vessels and nerves and serves to cushion and insulate the body. 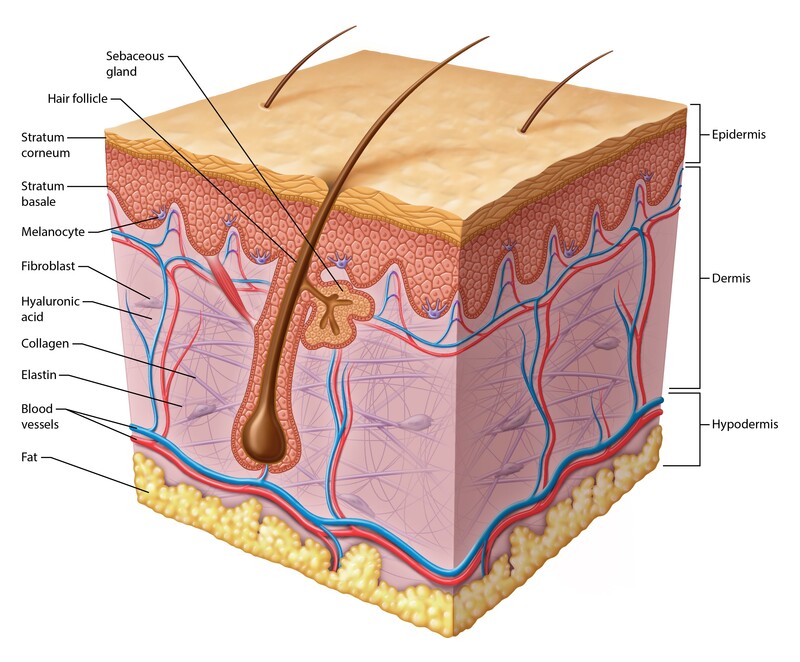 Epidermis: The outermost layer of skin is composed of five sub-layers. The most superficial layer is the stratum corneum, which is the skin’s natural physical and water-retaining barrier. The deepest layer, where skin cells originate and pigment is produced is called the basal layer. Dermal Epidermal Junction (DEJ): This is the area of tissue that joins the dermis and epidermis. It contains blood vessels that deliver nutrients from the dermis to the epidermis. Dermis: The middle layer of the skin contains elements such as collagen, elastin and hyaluronic acid, which provide structure and flexibility to the skin. Blood vessels, lymphatics, immune cells, nerve tissue, hair roots and sweat glands are also found in the dermis. Collagen: A protein that makes up 70% of the dermis providing skin with structure and support. Sun exposure and aging cause the breakdown and decreased production of collagen, which leads to fine lines and wrinkles. Elastin: A protein that gives skin its flexibility and the ability to bounce back after it has been stretched. Sun exposure and aging cause the breakdown and changes in elastin that leads to sagging skin. Sebaceous glands: These glands are attached to hair follicles and release an oil called sebum, which helps lubricate and waterproof the skin. In humans, sebaceous glands are most numerous on the face and scalp, and are found everywhere except the palms and soles. Blood vessels: A network of blood vessels is found in the dermis and subcutaneous layer. These vessels supply skin with oxygen and nutrients and play a role in regulating body temperature. Hypodermis: This innermost layer of the skin lies beneath the dermis. It is made up of fat, connective tissue, blood vessels, and nerves, and serves to cushion and insulate the body.